Sorry, San Francisco, but people are trading in the breathtaking views of the red-hued Golden Gate Bridge for Denver's snowy slopes and Seattle’s futuristic Space Needle. That’s according to LinkedIn’s April U.S. Workforce Report, which shows that since February 2017, the number of workers moving to San Francisco has dropped an astonishing 41% in favor of emerging tech hubs (and cities with, well, a much cheaper cost of living). 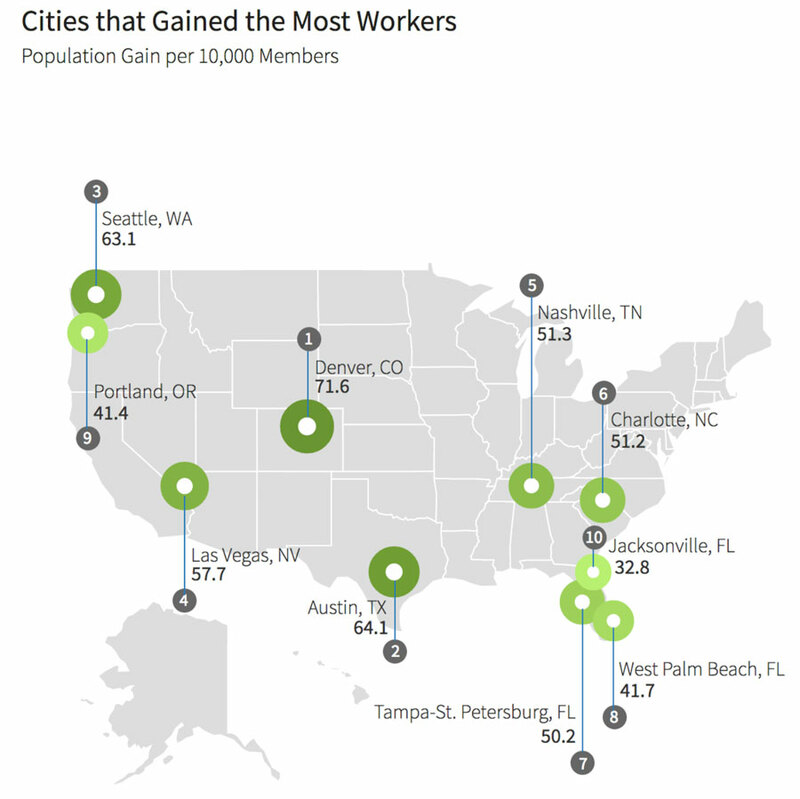 After Denver, Austin and Seattle gained the most talent, followed by Las Vegas and Nashville. It makes sense that the biggest winners are growing tech hubs that offer lower costs of living compared to the Bay Area. For instance, Nashville has emerged in recent years as an up-and-coming city for tech companies looking to get their start, according to a 2017 report (and it’s also on the shortlist to become the location of Amazon’s second headquarters). Meanwhile, Denver has been cited as another city drawing talent away from San Francisco thanks to the city government encouraging startups to the region through infrastructure investments. Seattle is the number one destination for people leaving San Francisco, according to our report, while less costly commuter towns, like Sacramento, also appear high on the list. So, if you’re thinking about where you might want to expand your recruiting efforts or even open a new office, the influx of talent in these cities makes them worth considering. 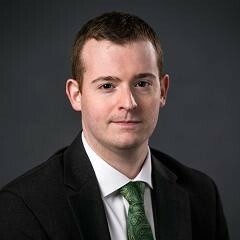 For every 10,000 LinkedIn members in Hartford, 60.6 left in the past year. According to The Hartford Courant, part of this is due to some of the state’s rich residents leaving, citing IRS data. As a result, they’re moving billions of adjusted gross income out of the area. "While Hartford has lots of engineering jobs that require advanced education, it just doesn't have the dynamism that an Austin, Raleigh or even Boston has," says Economics Professor Emeritus Ed Deak. 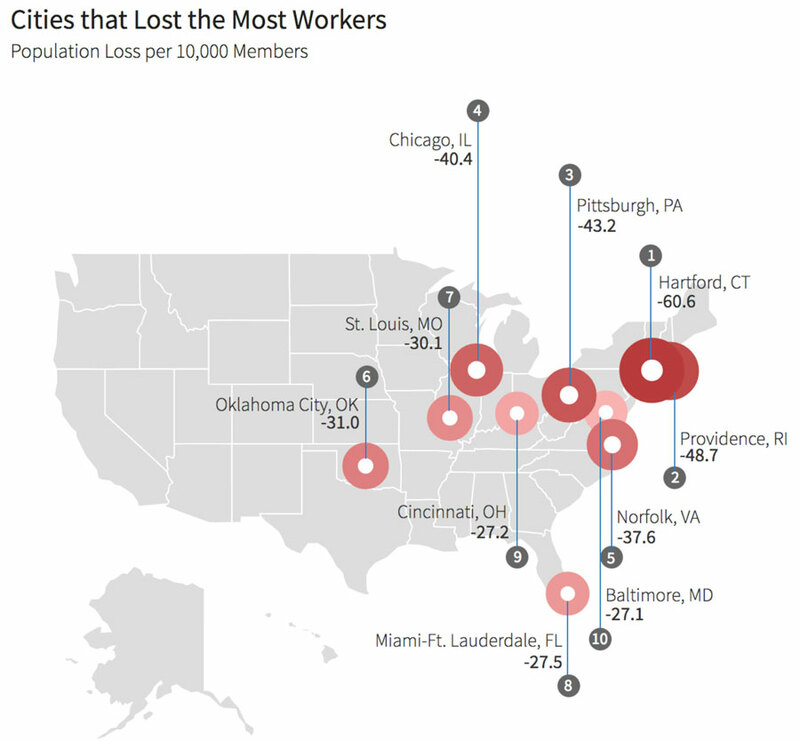 In addition, industrial cities such as Pittsburgh, Detroit, Minneapolis, and St. Louis are losing workers to the Bay Area as part of an ongoing trend for the U.S. heartland, according to our report. We also took a close look at the U.S. cities that have experienced the most total migration, with the highest number of workers both moving into and out of the city over the last 12 months. 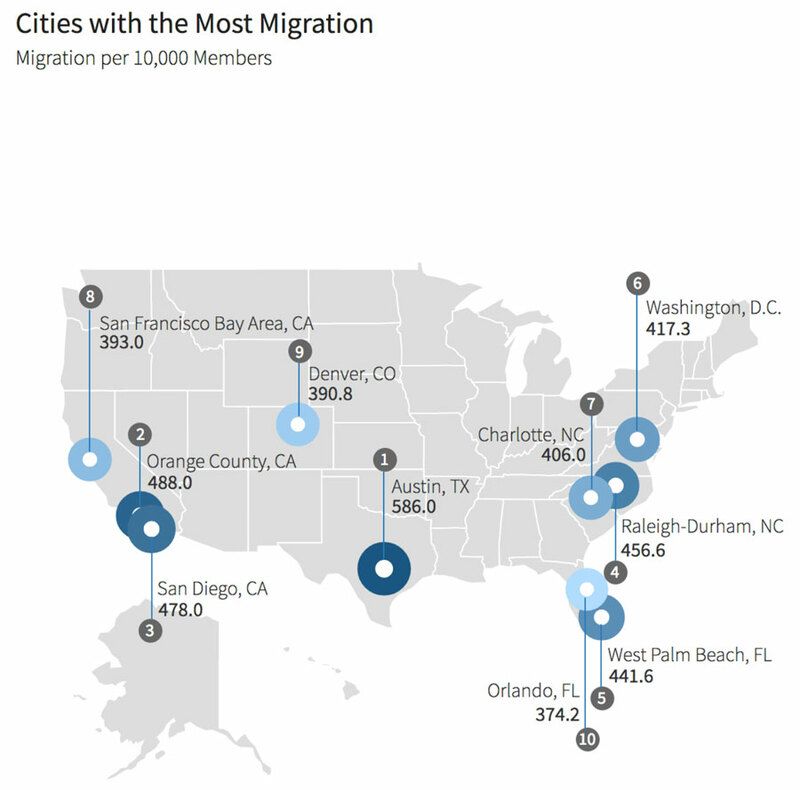 This list naturally includes some of the biggest gainers, like Denver and Austin, while the high total migration in North Carolina cities is partly driven by corporate moves and transfers to other nearby cities. And while people from all over the country come to the Golden State for its beauty and booming industries, as mentioned the high cost of living has also led many residents to seek out less expensive places to live and work. For more information on national talent trends, here are the detailed city reports for 20 of the largest U.S. metro areas: Atlanta, Austin, Boston, Cleveland-Akron, Dallas-Ft. Worth, Denver, Detroit, Houston, Los Angeles, Miami-Ft. Lauderdale, Minneapolis-St. Paul, Nashville, New York City, Philadelphia, Phoenix, San Francisco Bay Area, Seattle, St. Louis, and Washington, D.C.